But there's one toy that I remember hoping and praying I would get for Christmas. And when I got it, I adored it! It was a magnetic driving car. 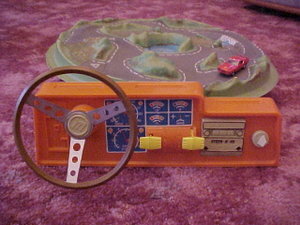 It would drive in circles around a track and you could steer it right and left as it drove. You could even make it go faster or slower with the accelerator. Sooooooooo cool! What was one of your favorite Christmas gifts as a kid? Here's a couple pictures of two toys similar to the U-Drive-It. I think this version came out in the UK. 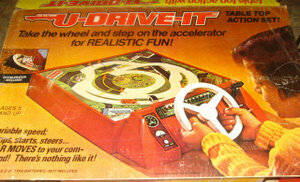 Instead of a steering wheel, you used a joystick to move the car around. This is the steer-n-go. The mountains in this version are cool. wow, those look like fun, do you think it's too late to write to santa and ask for one? that one with the joystick looks great! Grammy, you lived in such simple times. Playmobile. you still have all that stuff, too, don't you? It may have perished in the flood. That looks eerily familiar to some where in my brain. Hmmm, wonder if I had one? We had a race track where the horses kinda vibrated around the track. My favorite gifts (the wow factor ones) were not necessarily the ones I ended up playing with most. 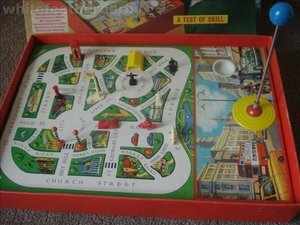 I spent many years playing with my Simon, big Barbie head and Kerbangers (the original non-wussy ones on a string). oh, i had one of those! you were a big barbie head girl, eh? *cough* i'm a little embarrassed now that i know you. what the heck was a kerbanger? I was most excited to get roller skates, but I loved playing with my Speak 'N Spell, Merlin and Atari 2600. I would take my barbie head to my dad's shop and put braces on her by cramming solder in her face with screw drivers. I pierced her ears. And did what I like to think of as the leader in the field of eye lid lifts. I don't want anyone thinking I brushed her hair and put lipstick on her, because that wouldn't be me. whew! i'm so relieved. for a minute i thought you were trying to come out of the "i'm secretly a cheerleader" closet or something. Never! But if I had a cheerleader doll, I would have made her leg braces after I was done breaking her legs. I'm not a monster.